The Cape Coral City utility expansion program (also known as UEP) is designed to provide the residents of Cape Coral and other municipalities a reliable potable water supply for drinking water and sanitary sewer connection for drainage, and reclaimed non potable water for use with irrigation systems. The UPE gives home owners the confidence of a clean reliable water source without the high maintenance and repair costs. If you own a piece of property or home in an area that has already been a part of the City's Utility Expansion, or are in an area where the City will be extending the water, sewer, and irrigation lines, it is mandatory to connect to the central system. Davis Jr. 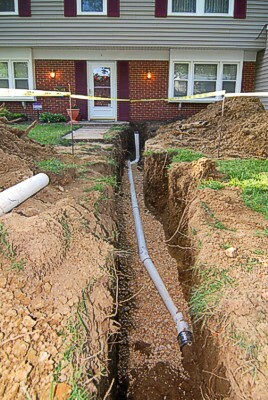 Plumbing, Inc. offers experienced water and sewer service installation. Whether you need to connect your home or business up to city water and sewer, have leaks in your current water supply system, or are experiencing problems with your drainage or sewer system, Davis Jr. Plumbing, Inc. offers superior service for affordable prices. Davis Jr. Plumbing, Inc.'s experienced plumbers will handle all of the installation process including installing a sewer main from the clean out at house to the City sewer tap at the street, then installing a water main from the shut off at the house to the City meter at the street. Finally, your irrigation supply will be hooked up from the sprinkler valve distribution box at the house to the reclaimed (non-potable) water supply at the street. We pride ourselves in using experienced technicians so that there is as little disruption to your property as possible with quality service and products that can't be beat. If you find yourself in need of a repair to your water or sewer lines, Davis Jr. Plumbing, Inc. has a knowledgeable staff with the proper tools and equipment to accomplish this quickly and affordably. Call us today to schedule an appointment for service or an onsite free estimate for plumbing projects needed. Please CALL for Emergency service! ©2007-2019 Website Design and Web Hosting Management Specialties Web Services, LLC.